Espada is Spanish for spade and refers to the dark liver patch on “Ace’s” neck. 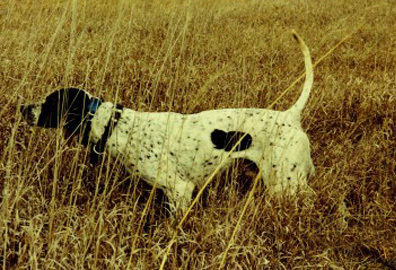 In November 2006, Ace turned in a beautiful four find performance to win the AFTCA National Walking Shooting Dog championship at Havensville, KS over a field of 40 starters from eight states. One judge described his race as “perfect – just where a dog should be and his bird work was immaculate – each find straight in front and he never moved a hair until collared”. Ace has other significant wins in both walking and horseback competition including a Derby Classic win and was the US Complete Shooting Dog Association runner up walking shooting dog for the Iowa region. He is currently being campaigned to add to his record. He is by The Usual Suspect out of Some Kind O’Trouble. 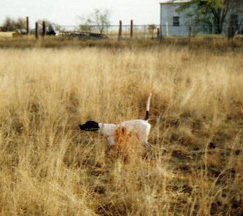 Littermate brother to Cannonero, “Speck” was named Runner Up AFTCA National Walking Shooting Dog Champion in January 2000 at the LBJ National Grasslands near Decatur, TX after a three find performance. Many thought he won this trial outright but ended up runner-up. 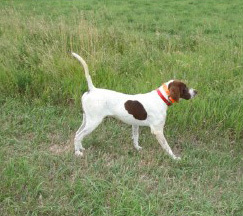 With 25 other placements including Classic wins and Texas Bird Hunters Association Derby of the Year, Speck was an exciting dog on the ground as he scoured the far reaches in search of birds. He had a lengthy career in walking and horseback trials but a back injury sustained during a workout ended his competitions prematurely later in life. CH Greypointe Cannonero – 3/10/95 -12/8/2006 by Therapy x Wrong Side O’Memphis. “Bull” totaled 40 field trial wins including the 2002 Region 17 Championship held at Piedmont, KS where he eclipsed the 38 dog field running in 35 degrees and rain. Judge Alex Johnson described it as one of the best performances he had seen. 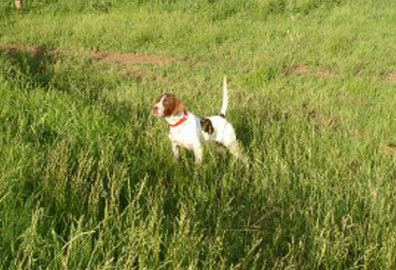 Bull was the Region 7 (Texas/Mexico) Puppy of the year as well as the Texas Bird Hunters (NBHA) Puppy of the year. 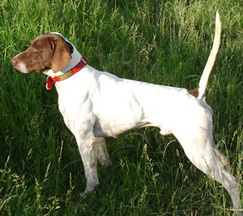 He also won the prestigious Royal Canin sponsored National Walking Shooting Dog of the Year for 2002-03. 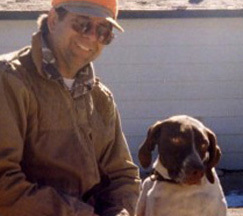 Bull was retired from competition in April 2006 after placing first at the Kansas Championship Association shooting dog stake at Toronto, KS - having repeated his win of the year before. It was a fitting end to a long career having won before he turned a year old and his last win coming after age eleven. Some Kind O’Trouble - 3/10/95 – 9/5/2002. Littermate to Bull and Speck, “Tanya” ran the limits of the country with flash and class. Trialed sparingly, she was notably named third at the 1996 NBHA Futurity Puppy Classic in a field of 48 starters. Bred to The Usual Suspect, she produced National Champion Greypointe Espada. While carrying puppies a couple years later, she was struck by a copperhead and unfortunately succumbed to kidney complications – a real loss to our kennel. ShutUp ‘N Kissme – 3/20/95 – 3/1/05. “Chapin”, littermate to Bull, Speck and Tanya is the mother of Derby Classic and shooting dog winner Greypointe Fandango and puppy winner Greypointe Flamenco who are currently being campaigned. 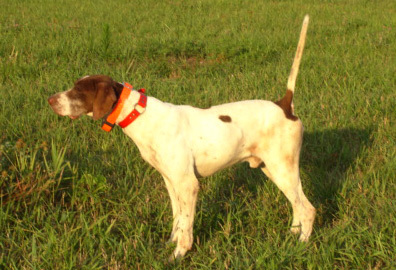 Chapin was trialed sparingly, had shooting dog placements and was one of my personal favorite hunting dogs before assuming her role as mother. Greypointe C’Quistador – Whelped 3/10/95. 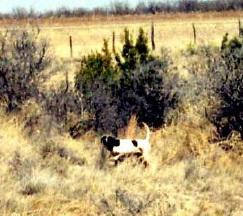 “Ponce” was a derby stake winner prior to being sold to a south Texas outfitter in 1997 who admired his strong way of going and bird finding ability. Ponce was standing naturally steady for flush and shot as a puppy and is the fifth of the five dog litter above by Therapy and Wrong Side O’Memphis to earn field trial placements.